Water views: Awesome! It's on the Beach. Of the many amenities available at Admiralty House, perhaps the most notable is that it features the largest beachside swimming pool on the island. And you can swim all year-round, because the pool is heated. As you approach the property, you will pass the two private tennis courts and move on along the private, tree-lined road that leads to the reception area and the ground level, covered parking. Your can earn rental income with your Admiralty House condo. The minimum rental period is 30-days. The property features 24/7 security assuring you that it is safe, as all of Marco Island is, to stroll along the bike and walking trails onsite. The property features a well furnished social room where folks gather to entertain or just meet and greet. From July through October each year you can watch young turtles enjoy the freedom of the beach as they leave their nests. It is not uncommon to be able to watch dolphins at play as they swim along the shoreline. Part of the intimate charm of Marco Island is that the island is not a playground for weekend tourists. Here you can enjoy a peaceful stay, whether it is for a month or a lifetime. The fabulous Esplanade Shoppes and a Winn Dixie supermarket are less than half-a-mile away. You can take an early morning stroll and sip a latte by the fountains outside of Starbucks, do a little shopping, and save room for a treat from Coldstone Creamery and feel like you have barely left your backyard. 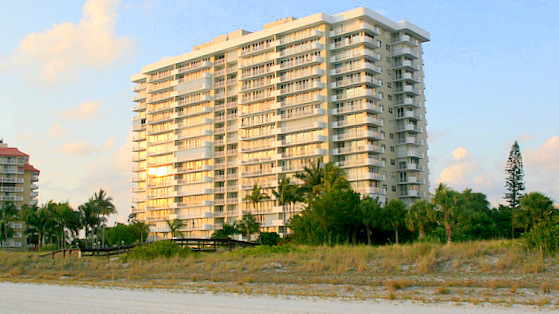 The Admiralty House is located at 140 Seaview Court, just off of North Collier Boulevard at the wide, upper end of Marco Island’s crescent shaped beach. Enjoy the quaintness and the beauty of Marco Island from luxury condo lifestyle of the Admiralty House.